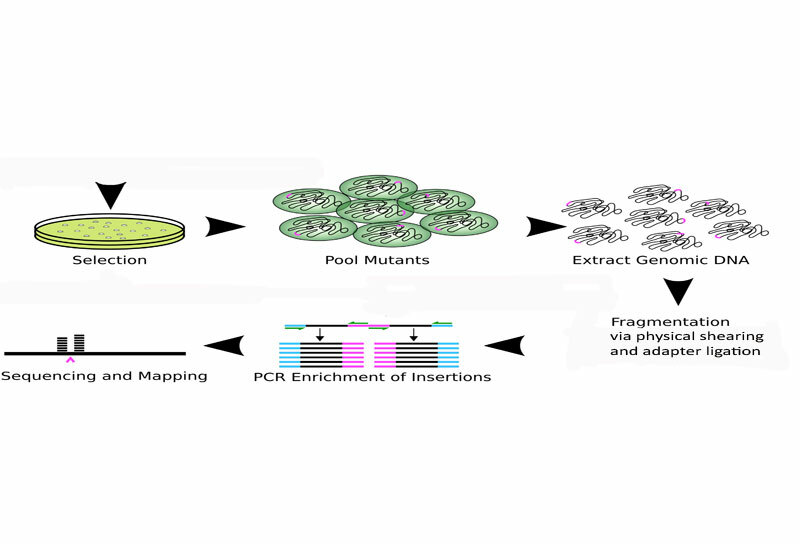 The TraDIS method involves a process of transposon insertion, pooling of individual mutants, extracting genomic DNA and making sequencing libraries then sequencing. Whole-genome sequencing is starting to become routine practice due to the drop in the cost of sequencing. From this mass of data, we try to fish out the genes present and understand what they do. Currently, many functional predictions are based on finding similarities with genes whose roles have previously been identified by the labour-intensive process of screening single-gene mutants for changes in cell behaviour. But how do we determine function on a large enough scale that can keep up with this explosion in genomic data? In 2009, the Pathogen Genomics team developed a method that allows millions of bacterial mutants to be studied at one time to identify genes that are either required for, help, or hinder a bacterium’s survival under any condition we can create in the lab. This method, known as TraDIS (transposon directed insertion sequencing), is based on a piece of foreign DNA called a transposon or ‘jumping gene’ that has the ability to move itself and randomly insert into host DNA, possibly disrupting a gene or functional genetic region. By bombarding bacteria with transposons, millions of cells with a single unique disruption in the genome can be generated and, using next-generation sequencing, we can tell exactly where insertions are, and how many cells contain an insertion in each gene. Using this method, two main types of information can be obtained: genes that are essential for growth and genes that are important in growth within a certain condition. TraDIS analysis involves identifying genes that are important certain conditions, as they contain more or less insertions than the control. In this case, the genes acrA and acrB are clearly important in resistance to the antibiotic ciprofloxacin (CIP) as they have less sequencing reads (representing insertions) when grown in CIP compared to an untreated control. Conceptually, this method is akin to identifying genes that are important in, say, marathon runners. If we sequence one million runners, each with a different single defective gene, we would expect people with defective genes important for marathon running, such as those involved in muscle generation or leg length, will tend to drop out, whereas runners with disruptions in genes unrelated to running, such as eye colour, will complete the race at similar rates. Any genetic defects important for human survival will not be seen before or after the race, because these runners would never have been born. This technique has allowed us to probe a number of bacterial pathogens, such as Salmonella Typhi and Tyhpimurium which cause Typhoid fever and gastroenteritis respectively, for genes essential for their growth. These genes may represent targets for antibiotic development, as they perform functions these bugs clearly need to survive. TraDIS is extremely versatile and can be applied to test a range of conditions such as antibiotic resistance, bacterial sporulation, and survival in models of virulence and infection. Overall, this method will be an increasingly useful tool for fast and effective screening of genes and we expect it will become widely adopted in the near future. Amy Cain is currently undertaking her postdoctoral research in the Pathogen Genomics group under Dr Julian Parkhill. Lars Barquist is a PhD student at the Wellcome Trust Sanger Institute and EMBL-EBI with Dr Alex Bateman. Langridge, G.C., Phan, M.D., Turner, D.J., Perkins, T.T., Parts, L., Haase, J., Charles, I., Maskell, D.J., Peters, S.E., Dougan, G., Wain, J., Parkhill, J. and Turner, A.K. (2009) Simultaneous assay of every Salmonella Typhi gene using one million transposon mutants. Genome Res, 19, 2308-2316.